The Imperial Legion is the military force of the Empire of Tamriel. Serving under the authority of the Emperor, the Legion, with its vast numbers, quality training, and rigid discipline, is considered one of the most powerful fighting forces ever assembled. A history and detailed description of the Legion is provided here. The Legion is a joinable faction in Skyrim, and its conflict with the Stormcloak Rebellion plays an integral role in the main quest. The Imperial Legion is in conflict with the Stormcloaks during Skyrim's Civil War, and is charged with hunting down and eradicating its members throughout the province and quelling the rebellion. The Imperial Legion in Skyrim is led by General Tullius. Following your narrow escape from execution at Helgen during the quest Unbound, and just after Alduin flies off, you will have a choice to follow either Hadvar or Ralof into Helgen Keep. If you choose Hadvar, and then from the keep either accompany him on the road to, or leave and rejoin him in Riverwood, he will invite you to join the Imperial Legion, or he might make the offer in Alvor's house in Riverwood. If you instead follow Ralof, you will be asked to join the Stormcloaks. If you make no choice at that point, Imperial soldiers that you will encounter in your travels, or upon entering an Imperial camp will encourage you to join the Legion by going to Solitude, where you will be directed to Legate Rikke at Castle Dour. Speaking with her can initiate the quest Join the Imperial Legion. Before you complete that quest, however, (or before you start it) you may instead decide to join the Stormcloaks. If you do so, the Join the Imperial Legion quest will fail if it has been initiated; however, you will have an opportunity to join the Legion later. At the end of the second quest for the Stormcloaks, The Jagged Crown, you can take the crown to General Tullius, who will admit you to the Legion. Three achievements (50 points; 2 Bronze and 1 Silver) are unlocked by completing either Civil War questline (either Imperial Legion or Stormcloaks). Get Outfitted: Get a free set of Imperial armor. The Jagged Crown: Find the Jagged Crown for the Imperials. Message to Whiterun: Deliver the message that will decide Whiterun's allegiance. Note: A number of factors related to the optional main quest Season Unending can influence which of these quests are initiated. Camps of Imperial Legion soldiers can be found in each hold of Skyrim except for Haafingar. These are marked on the map with the symbol of the Seal of Akatosh. Imperial camps will only ever exist in holds controlled by the Stormcloaks, and vice-versa, so these camps may not exist, depending on the player's chosen side and progress in the Civil War. 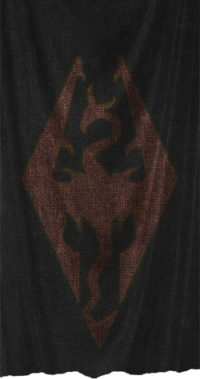 If you side with the Imperial Legion, you cannot join the Stormcloak rebellion. Joining the Imperial Army may cause random spawned groups of Stormcloak Soldiers to attack you, and you will not be welcome in Stormcloak camps or forts anymore. Esta página foi modificada pela última vez à(s) 07h08min de 12 de novembro de 2015.